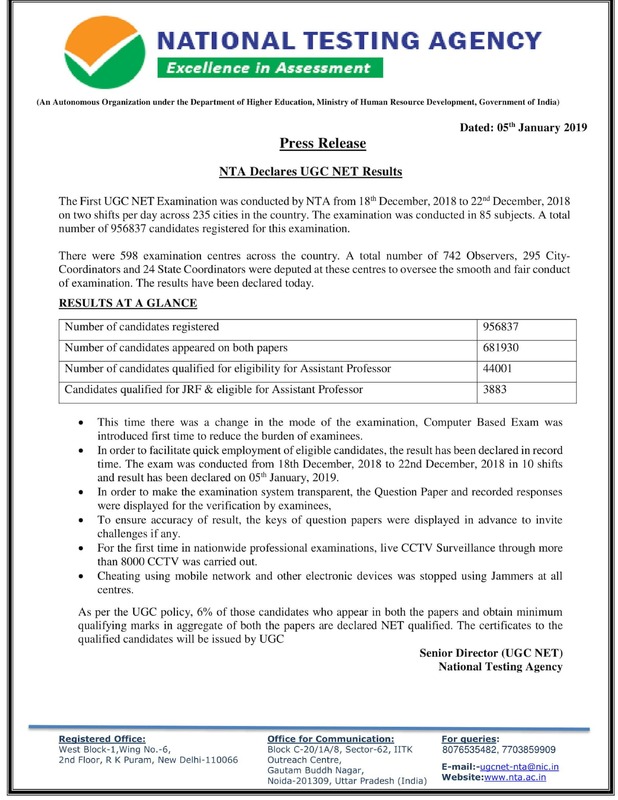 UGC NET Dec 2018 Result – NTA has declared UGC NET Result of exam held in December 2018 on January 5, 2019. Result of UGC NET Dec 2018 has been published 5 days early. Candidates can check the result at official website of National Testing Agency (NTA) ntanet.nic.in from link below. Enter application number / roll number and date of birth to login. Result shows total marks scored in each paper and qualifying status. NTA has declared result based on the marks obtained by the candidates in all three papers. The candidate who qualify in the exam and make to the merit list are eligible for Assistant Professor only or/and Junior Research Fellowship. Candidate should preserve printout of scorecard. Check the article for complete information on UGC NET Dec 2018 Result. UGC NET Dec 2018 was held on five days in the month of December. The exam got over on December 22, 2018. According to result notification, 9,56,837 candidates registered for the exam and 6,81,930 candidates appeared in the exam. NTA first released the answer key of NET and then the result as per the schedule given below. Check the important dates for UGC NET Dec 2018 result. Check Result: Click here to check UGC NET Dec 2018 Result. NTA has released the cut off of UGC NET December 2018 exam along with cut off. Check it below. Check Cut Off: Click here to check UGC NET Dec 2018 Cut Off. 44,001 candidates have qualified for the eligibility for Assistant Professor and 3883 have qualified for both JRF and eligibility for Assistant Professor. 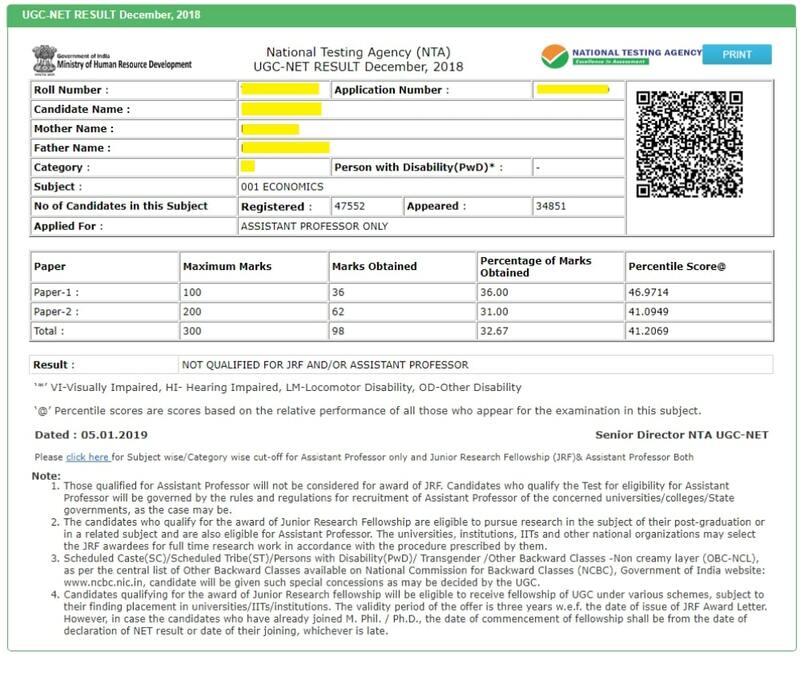 How to Check UGC NET Dec 2018 Result? Appearing candidates can check the result from NTA official website or click on the link provided to check the result. Follow the steps mentioned to check the result. Click the on the link provided above. Enter the application number, roll number and date of birth as given on your admit card. Check the list of printed details on the UGC NET Dec 2018 Result. The leading 6% of the appearing candidate whose name will appear in the merit list will be eligible for the post of Assistant Proffesor. For slot distrubition distribution subject-wise and category wise following calculation is used. NTA will prepare a merit list after the declaration of the result. NTA will release the merit list based on the marks obtained by the candidates in all the three papers. A separate merit list will be prepared for Junior Research Fellowship (JRF).